Explore the different regions and locations on Fallout 76's map. Fallout 76's map is four times larger than Fallout 4, which means players have lots of room to explore in Bethesda's post-apocalyptic West Virginia. 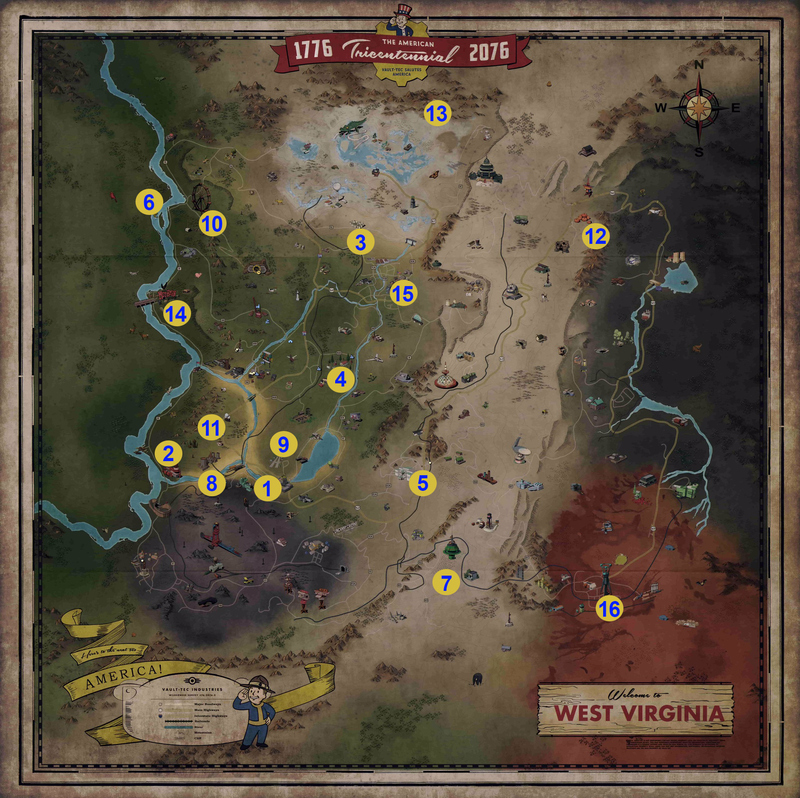 And there's lots to see: not only is the the Fallout 76 map a big one, it's packed with locations to visit. We've been scouring Fallout 76's map as we play the beta and keeping track of the coolest and most useful locations we've found. We'll be adding more Fallout 76 locations below as we find them, but here are the most notable spots we've found so far. Fallout 76 is divided into six distinct regions with different biomes, flora, fauna, and levels of difficulty. The Forest: A wooded and mountainous area in the west that includes the towns of Charleston and Point Pleasant, plus the Nuka-Cola Quantum Plant. It's where Vault 76 is located and where players will begin the game, so it's the easiest region to survive. Savage Divide: The divide runs like a strip from north to south through the center of the map. We still don't know much about this region—it's savage, presumably—but it contains the Top of the World Ski Resort and the Green Bank Telescope. The Mire: Located along the eastern portion of the map. It's home to Harper's Ferry, a town situated along the Potomac and Shenandoah rivers. Toxic Valley: After the bombs fell on a number of chemical plants and factories, this region was blanketed with white dust. It's also the location of what looks like a space station that crashed to Earth. Ash Heap: An industrial area in the south west portion of the map, including a mining operation at Mount Blair and trainyard. Cranberry Bog: A swampy area in the south east. Contains the town of Watoga, notable for its monorail and tower. Todd Howard described this area as being "really, really hard" and not suitable for low-level characters. Now let's get into some specifics. Here are some of the Fallout 76 locations within those six regions, and what we know about them so far. We've marked and numbered them on this handy map so you can find them yourself and we'll be updating with more locations as we explore further. The Nuka Cola Plant in Kanawha has two Fusion Core terminals to pluck batteries from for your power armor. This is another good solo spot where you’ll face mostly Scorched enemies that can be picked off one-by-one. Several players have also reported finding a suit of power armor here, so it’s a good spot to keep an eye on if you need your first set of armor or just need to stock up on Fusion Cores now and again. The real world West Virginia Penitentiary is a historical tourist site. In Fallout 76’s Appalachia, the building is home to a gang of Super Mutants. Although the prison is relatively close to early areas of the game, you’ll want to go in prepared. Stepping into the prison yard will get you a face full of bullets without much chance to sneak around first. If you do happen to tackle the challenge, there are workbenches for creating armor, ammo, and weapons. There are a couple terminals to hack if you want to pull the classic Fallout trick of turning the Protectrons against your enemies. There’s also a power armor spawn point in a shed in the central prison yard to look for! Helvetia is a town in The Forest region. The real town of Helvetia celebrates a Mardi Gras-like holiday called Fasnacht, which involves the wearing of masks. Reportedly, players will be able to collect 10 different masks from this town in Fallout 76. This is certainly a fitting locale for Fallout 76 because there's a real bunker beneath the Greenbrier Resort, upon which the Whitespring Resort is based. The bunker was built in secret during the Cold War as a place to house Congress should there be a nuclear attack. Expect to find lots of robot butlers on patrol. There is a single Deathclaw on Deathclaw island. You should pay it a visit, just to say you did. If you survive the small-talk, there’s a safe which will require level 3 lockpicking abilities to open. The Spruce Knob Campground is a more impressive location than its name implies. It’s a lot more fortified than your average campground and only a few super mutants are standing between you and conquering it. Once you do, you can claim the public workshop for only 25 caps. After you’ve made it your own, an event will trigger in which you fight off several waves of enemies making a beeline for your new perch. There’s also a handy gold deposit near the center of camp to collect ore from. The Poseidon Energy Plant is the site of a lengthy group event to repair the plant that involves running all over the interior to repair generator stations and fix leaky pipes. If you want to attempt Powering Up Poseidon, make sure to bring several friends or rally others on the map around you. Ii is a bit of a maze and getting around to each of the many repair spots is a chore without enough hands to pitch in. You'll find a super mutants occupying this airport south of Vault 76, but its relatively wide-open airstrip means that you can take most of them down from range if you've got a good sniper rifle. You'll also be able to clearly see the invading waves of robots who attack if you claim the public workshop here, making it a pretty easy grab for solo players. Look for a silver mine in the middle of the runway to the north. The Tyler County Fair Grounds is the site of another public workshop that can be claimed. Be warned, it’s a hefty 100 caps to make this one your own. It’s mostly home to Scorched and Radroaches, so it’s not a bad place to try taking on solo. Once there, you can also pick up a quest to find a lost Jangles the Monkey and a public event that will send you off to kill wolves (because every RPG needs a wolf-killing quest). The Giant Teapot isn’t a particularly useful location; it’s just amusing. If you stick around for a few minutes, you may be lucky enough to join in on the event centered around the steamy site. The giant teapot building apparently actually brews tea because the quest revolves around guarding its hot water pipes from various attacking critters. The Pumpkin House is another must-see location that has a lot more personality than functionality. Tended by a Mr. Handy unit named Jack O’Lantern, the Pumpkin House is completely strewn with carved homages to various Fallout icons. You can help Jack collect pumpkins from the yard and sneak upstairs to nab a fashionable hat off his shelf. Just watch out for the Super Mutants across the street. They aren’t friendly neighbors. There's the remains of crashed space station in the Toxic Valley region. While it's not canon, the canceled game Fallout: Van Buren planned to have similar-looking space stations that contained nuclear missiles. We know players will be able to fire nukes around the map in Fallout 76, so maybe this is one of the locations they'll be able to launch them from. Point Pleasant is a great early stop on your tour of West Virginia. It’s occupied by a number of low level Scorched that you can wipe out easily solo or in a group. The church in the northeast corner of town is stocked with plenty of meds and chems to loot. It’s also got a convenient chemistry crafting station for creating chems of your own and a medical supplied vending machine if you have caps to spare. Make sure to pay a visit to the Mothman Museum (a real West Virginia legend and tourist spot) and don’t miss the possible power armor hanging out on the rooftops of town. This is another real location—sort of. While in the game it's Vault-Tec University, it's based on West Virginia University in Morgantown. In the game, it's located in The Forest region. Watoga is a long hike from your first steps out of Vault 76 but as a main city hub it may be worth the walk. Watoga is home to a power armor spawn point and numerous individual locations to discover. If you make a trip all the way there, you may as well stick around to become mayor for the day in the Watoga Municipal Center. There are a number of locations we don't have any real details about yet, but they're shown as locations on the in-game map in Fallout 76 footage. Here's a brief list, and we'll add more information as we find it.